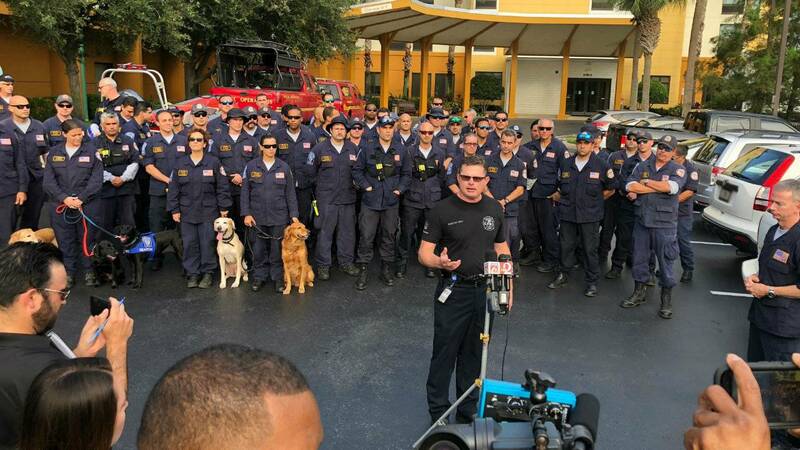 ORLANDO, Fla. - Men and women who spent the last week rescuing people from rising floodwaters in North Carolina returned to Florida on Friday to a hero's welcome in Orlando. Sixty members of FEMA's Florida Task Force Two were surprised with a welcome that included a flag-draped entrance at the Springhill Suites on International Drive, hosted by Orange County Fire Rescue. "I shed a tear," task force dog handler Jennifer Brown said. She said the task force's two black Labrador retrievers help find missing people. Their skills and the skills of her teammates were put to the test after Florence created floods all over the Carolinas. Many of them had conducted rescues after hurricanes Harvey and Katrina. Some of them helped after the Sept. 11, 2001, terrorist attacks. In North Carolina, they said they helped pull residents out of cars being swallowed by floodwaters. They also helped people get out of their homes. "The water was very, very deep," task force member Nicholas Wohl said. "In fact, when I got into the water, I went all the way up to my neck and I had to begin swimming. That's how deep it was." Wohl and his teammates said the water was rising so quickly and moving so fast that many who lived there couldn't keep up. He said his team fought to save a mother and her young child, but the water was too much. "It was still very heartbreaking for all of us to not be able to bring that 1-year-old toddler back to his mom," said task force Capt. David Duanas of Miami. That's why the special homecoming thrown by Orange County Fire Rescue was so valued, they said. "This was a very pleasant surprise, and my hat is off to our brothers and sisters with Orange County Fire," Duanas said.